This Tuesday, we at Pure Hemp Botanicals officially announced the addition of a Pure Hemp Oil to our line of plant-based health and wellness products. Staying true to our commitment to produce products free of additives and contaminants, our tinctures are made solely of organic hemp seed oil and hemp Pure Hemp Oil concentrate from locally grown industrial hemp. Pure Hemp Botanicals’ Pure Hemp Oil tincture is non-psychoactive, like all of our products, and utilizes Pure Hemp Oil. Dosage for our new Pure Hemp Oil tinctures matches our capsules so that you can move easily between all of our Pure Hemp Oil products. The dropper applicator intended for sublingual administration (or under the tongue) provides quick absorption and the ability to control your dosage more precisely than other forms of Pure Hemp Oil products offered in premeasured doses. It may also be utilized topically. A tincture is a liquid extraction of an herb that can be taken orally. In most cases, alcohol or vegetable glycerin are used for the extraction. At Pure Hemp Botanicals, we use Co2 extraction instead. 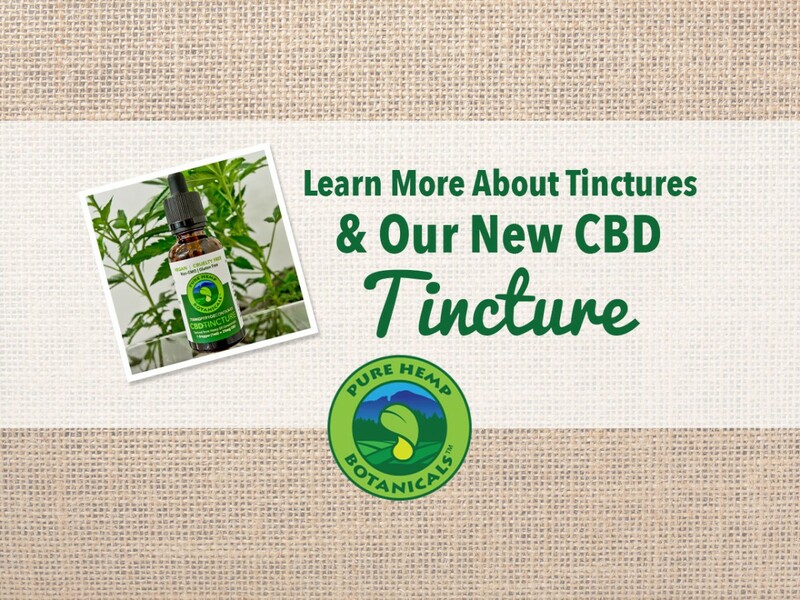 Our pure and additive-free tincture is naturally flavored by the organic refined hemp seed oil, which eliminates separation and the oily aftertaste you may experience with other Pure Hemp Oil tinctures. Do you have to apply a tincture under your tongue? The most effective method to take a tincture is directly under the tongue because it will enter your bloodstream faster and take action quickly. If you use this method, it is best to avoid other liquids or foods for about 15 minutes afterward. You can mix it with juice or add it to warm water with lemon juice or honey if you prefer to mask the taste. Keep in mind that heating a tincture in the microwave may weaken or kill the therapeutic benefits. Be sure to heat the water beforehand if you’re planning to drink it as a hot beverage. How is the dosage determined? Tinctures are taken by the dropperful. When you squeeze the bulb at the top of the dropper and release it, the liquid will fill the glass tube. The size of the bulb determines how much liquid will fill the tube. It is more precise than you would guess. One dropperful of Pure Hemp Botanicals’ Pure Hemp Oil tincture equals a 1ml serving with 25mg of Pure Hemp Oil. Our 1oz bottle contains 30 servings per bottle. You can choose to take a partial serving, full serving, or multiple servings at one time. What is the best way to store a tincture? A non-alcohol tincture like Pure Hemp Botanicals’ should be kept in a cool, dark place away from light and heat sources. Just as spices in your kitchen can loose their flavor if you store them over a hot stove, storing a tincture near a heat source can diminish its therapeutic properties. Also, in rare cases, mold can grow in a tincture if it is improperly stored. It will be obvious if the tincture has gotten moldy because you will see whitish patches floating in the dark liquid. Before every use, check to make sure that your tincture is its usual pure dark color.